Before snapping this shot the mother lions had just brought back their kill, a Thompson Gazelle, to the pride. 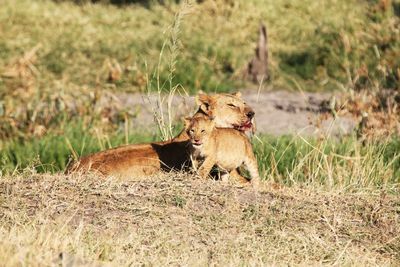 The females in the pride teach the kids how to hunt and bring back the food for the alpha male. This was an incredible sight! I took over 800 pictures of lions on the Serengeti, but this picture just spoke to me. Schirm, Cassandra, "Mother Lion with her cub after a big kill on the Serengeti" (2014). Study Abroad Photo Contest. 9.